Gain the ultimate advantage with our FREE eBook "How to use the Wave Principle to Boost Your Forex Trading"
The foreign currency exchange market, known as forex, is the most liquid financial market on the planet -- liquid to the tune of $5.3 trillion traded per day! That basically means every single day in forex is the day after Thanksgiving -- a.k.a. "Black Friday" -- with a stampede of traders pounding at the front door come opening bell, and then frantically racing up and down the market aisles in search of opportunities. It's madness. Market turns are lightning fast. You have to be faster. You have one single goal: Get there before they're gone. That goal, however, is difficult to attain if you're following the blueprint of mainstream financial analysis; which tells you to look outside the market for clues as to where prices will go next. The trouble with this strategy is that when you have your eyes focused outside the markets, you often miss high-confidence trade set-ups developing on the price charts themselves. "The euro weakened against other major currencies after data showed that Germany's private sector activity expanded at the slowest pace since July last year." 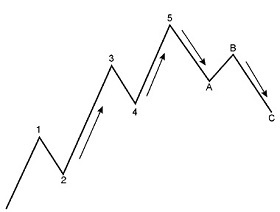 "The upward pattern is still anticipated to end and thereby complete a larger circled second wave correction. Therefore, we will continue to look for an impulsive five-wave decline back toward 1.4035 to signal that an expected circled third wave decline had probably started." 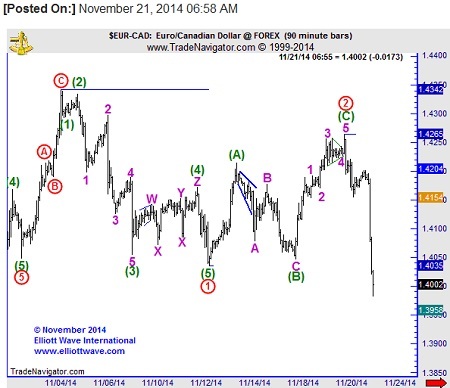 The next chart shows you how EURCAD fulfilled its third wave script by falling to a one-month low. 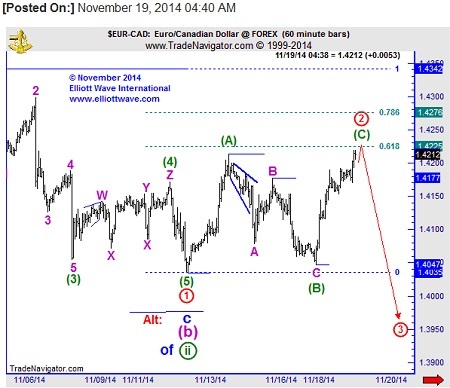 You've just seen how Elliott wave analysis has a very real place in the world of forex trading. Now, you can ensure that it also has a very real place in the world of your forex trading: The 14-page eBook "How to Use the Wave Principle to Boost Your Forex Trading," by EWI's senior Currency Pro Service analyst Jim Martens. "Here you see an idealized Elliott wave with five waves trending up, and three waves trending down. Which waves offer trading opportunities? Waves 3, 5, A and C offer the best opportunities, though I typically do not trade wave A. If I had to choose just one wave, it would be wave 3 because the third wave is usually the longest and the most powerful of the impulse waves. Trading the most powerful wave also offers the opportunity to trade with the best risk-reward ratio." "Let's concentrate on trading wave (3) since it's usually the longest and strongest wave, and the trend is clear. That means we want to identify the wave (2) that will lead into a strong third wave." "Based on one rule of the Wave Principle, I know where the count becomes wrong. Wave (2) cannot retrace more than 100% of wave (1). So I draw a line at the start of wave (1) (marked with a dashed line labeled "Protective Stop") and if the decline surpasses that level, I know that my count is incorrect. 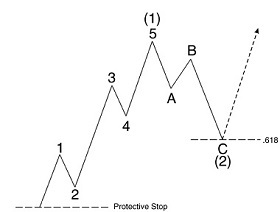 Elliot wave is one of few methodologies that give us an absolute number for our protective stop." This article was syndicated by Elliott Wave International and was originally published under the headline Every Day is Black Friday in the World of Forex. EWI is the world's largest market forecasting firm. Its staff of full-time analysts led by Chartered Market Technician Robert Prechter provides 24-hour-a-day market analysis to institutional and private investors around the world.